Denver men’s basketball took the court in Magness Arena for their home opener Wednesday, Nov. 18 against Utah Valley University where the Pios secured the 75-62 win over the Wolverines. The match marked the first meeting between the two teams. The Pios came into the match 2-1 returning from Santa Clara where the team competed in the 49th annual Cable Car Classic Tournament. The Pios lost their opener against Milwakee 71-58, but won the following two contests against Santa Clara with a 55-33 win and a victory over Lipscomb 82-69. Denver tallied a total of 36 three-pointers throughout the tournament, 16 of which were scored during the game against Lipscomb. Tonight’s game opened with a strong start from the Pios who lost the tip-off, but quickly recovered. Redshirt senior forward, Marcus Byrd of Highlands Ranch scored 7 points within the first six minutes of the game. Denver shot 55.2% (16-of-29) on the court and 45.5% (5-of-11) shots taken outside the arc during the first in comparison to Utah Valley who shot 33.3% (7-of-21) and 60.0% (3-of-5) three-point attempts. The redshirt sophomore, Duke Douglas (New Orleans, Louisiana) who set a career high with 11 points said, “[We’ve] been playing teams with really good transition offenses and that was [our] goal to try and stop those.” The Pio defense forced 11 turnovers during the first half. Denver’s defense prevented Utah Valley from converting their shots and, in turn, forced them to attempt field goals. 16, almost half of the Wolverines 33 points were scored from the free-throw line where the Wolverines received a 88.9% (16-of-18), Denver was sent to the stripe 11 times where they converted eight of their attempts to earn a 72.7%. During the second half Denver dominated the scoreboard maintaining a double-digit lead for the entire final twenty minutes of play. The Pios were able to drain crucial three-pointers from freshman guard Joe Rosga (St. Paul, Minnesota) and sophomore center, Christian Mackey (Kirkland, New Mexico) that aided in the team’s continuous momentum. In addition to Douglas’ 11 points, Denver generated four players who tallied double digits including; Byrd who led the night with 14 points, senior guard, Nate Engesser (Colorado Springs, Colorado) who came up with 11 points, and freshman forward C.J. Bobbitt (Harker Heights, Texas) who scored ten points and grabbed six rebounds. By the end of the night, both teams were sending each other to the free-throw line but luckily, Denver had secured a large enough lead that Utah Valley was unable to catch up. Denver returns to Magness Nov. 25 to play Idaho State at 4 p.m. to continue their five game home court streak. It was a slow paced game with the fouls but it was good to see DU win when the 3-point field goals are not falling (.350%). Bobbitt looked very good and Rosga and Neff had an off shooting night so it was the upper classmen that carried the night. The senior class is performing way above expectations. Marcus Byrd, Nate Engesser, and Bryant Rucker are proving to be a very good core group of players. Rucker continues to be the most improved player on the floor with consistent, steady play. With no juniors, the three seniors MUST play like seniors or DU is doomed. Freshmen and sophomores are much less consistent, as they are still growing into their adult bodies, lack game experience against men and a still adjusting to the grind of college life, D-I practice and coaching demands and a long college season. DU right now is 3-1 and while we like that result number, the Pomeroy rankings (which rank all D-I teams 1-363) show us that most of the teams DU has played aren't very good teams - Utah Valley is 332, Lipscomb is 286, and Santa Clara is 269. Only Milwaukee at 125 is ranked higher than DU (ranked 157) and not surprisingly, they beat us. The good news (or is it?) is that all of DU's remaining non-league opponents, as of right now, have lower Pomeroy rankings than the Pios do. Idaho State is 335. South Alabama 254, Air Force 224, Wyoming 196, San Diego 209, Weber State 180, N. Colorado 295, E Washington 193, and UC Riverside is 162. With many of these games at Magness Arena, the Pios should, if you believe the numbers, rack up some more wins before the Summit league schedule begins. And the rest of these non-league home games will be played with students on winter break. Looking at Facebook photos of yesterday's game I saw loads of empty seats in the background. I think they are smart to play down. They can give the freshmen lots of PT and experience some success. Ken Pom is usually very accurate so thay should be able to play 10-11 deep many of their games. 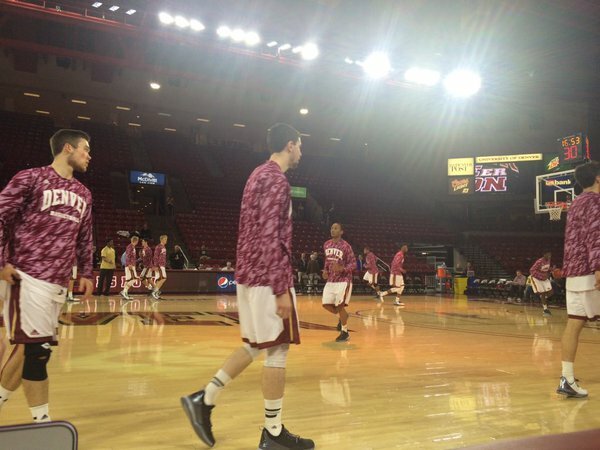 DU will always play about 90% of the non-league schedule while the DU students are on break. That's the reality of the quarter system, and DU's very unique six-week winter break between Thanksgiving and New Year's Day. It really hurts DU's ability to build a basketball culture here with students are gone that long every year. Attendance last night was listed as 1,128 people and there were probably 750 people actually there. I would say 100 students were there, mostly for the free hoodies they were giving our, and a lot of them left well before halftime. I wish they would have made some noise, but alas, at least some of them showed up for free swag. That's better than the the other 11,500 students who could have come to the game, but didn't. I know Utah Valley isn't Duke, and there was no ESPN there to beam student faces across the country, but I wish there were at least 250 students that could care enough to support their school. Students support hockey and lacrosse. Why not men's basketball? What do you think? 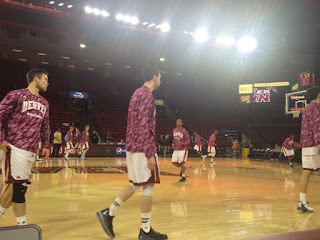 DU (and Colorado in general) does not have much basketball tradition and I get that. We also don't play many recognizable opponents or have great rivalries, nor do we have many fantastic basketball players. Students today have a lot of amazing entertainment options. All that said, D-I basketball that is competitive (and DU usually is very competitive at home) should be able to draw a couple hundred students each time out. Instead of going to California the team could have played two home games against hopefully schools students have heard of. The other issue is that students are in the middle of finals this week. Utah Valley is the largest public university in Utah, with almost 34,000 students. It became Utah Valley university in 2008, and was Utah Valley State College before that. It's a big school and it joined the WAC conference when DU left in 2012.